The code below is used in the Tax Aware Backtest Framework presentation at RFinance 2016 . First an Artificial Example demonstrates the impact of taxes by exploring the difference between long-term and short-term capital gain taxes. Suppose we have two identical assets, two clones of SPY for this example. Consider an annually re-balanced strategy that does 100% turnover by moving from one SPY clone to another. The OneYear strategy does the re-balance at the end of the year, hence it is subject to the short-term capital gain tax. The OneYearOneDay strategy does re-balance at one year plus one day, hence it is subject to the long-term capital gain tax. Please note that implied tax rate is lower then tax rate specified in the default.tax.control function. This is due to the two Bear markets during the test. The losses incurred during the Bear markets are later on offset with gains during consequent Bull markets. In reality the impact of taxes is not that profound. Next, let’s study a more realistic example. Consider a monthly re-balanced strategy that allocates across 9 sector ETFs using either equal weight or minimum variance weighing schemes. 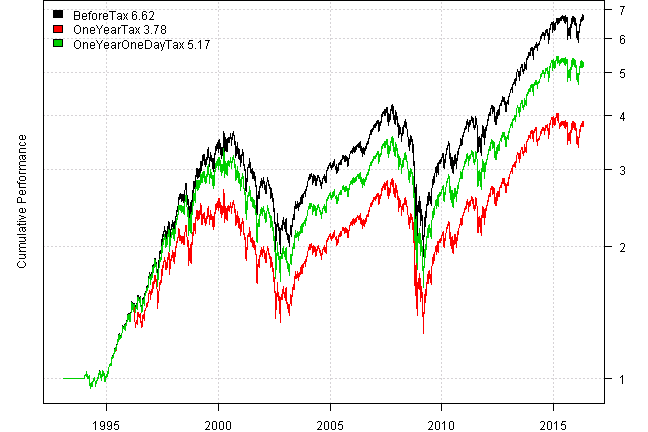 Both strategies produce 5.3 CAGR after tax; however, before taxes the minimum variance strategy performs better. The reason behind the different average implied tax rate is the turnover. The equal weight strategy has stable allocation and only produce 29% turnover. While the minimum variance strategy is a lot more active and produce 143% turnover. Hence resulting in the higher average implied tax rate and bigger impact of taxes. The above example demonstrates that for taxable account it is very important to have proper performance metrics; otherwise, you might select an inferior strategy. Please remember to specify the tax rates that are applicable to your personal situation using tax.control. Thank you. Please see the Back-test Reality Check post for more examples. For your convenience, the 2016-05-15-RFinance2016 post source code.